It's a sweltering Tuesday and we are at Pooja Ice Bhel, a nondescript food stall in Pai Nagar, Borivli, where owner Paresh Sejpal is busy setting up his thela. We are here to sample the 45-year-old's self-proclaimed invention, the fuski. The term, Sejpal says, has its origins in an inside joke, among his assistants. 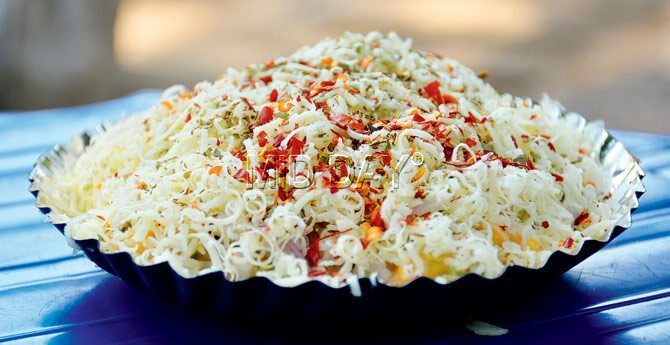 The dish is essentially a pizza filling, served on sev puris with cheese sprinkled generously over it. "I am not aware if the word fuski means anything. But it was just so catchy that we stayed with it - it gets people curious enough to order it." The ingredients - corn, onion, capsicum, tomato, olive - are finely chopped. "We keep them chopped and ready. When an order is placed, we quickly mix them with mayonnaise and serve it all in three minutes," Sejpal says. Priced at Rs 90 - which might seem dear for a street-side item - the fuski comes in two flavours: Italian and Mexican. While the former is a milder version, packed with flavours, the latter is hot and fiery. When the Italian fuski is served, all we can see is a mound of grated cheese, sitting on a steel plate. We dig in to find the sev puris that neither appear nor taste like your usual street fare. They are more like biscuits, topped with herbs. The dish reminds you of a homemade pizza, peppered with crunchy puris. "The puris are homemade, although not by us," says Sejpal refusing to divulge where he sources them from. A plateful is sumptuous enough for two. But, half way into it, we are compelled to tap out to try the fiery Mexican version. The fuski is essentially a pizza filling, served on sev puris with cheese sprinkled generously over it. Competition, for Sejpal, is only one stall away, as we soon find out. 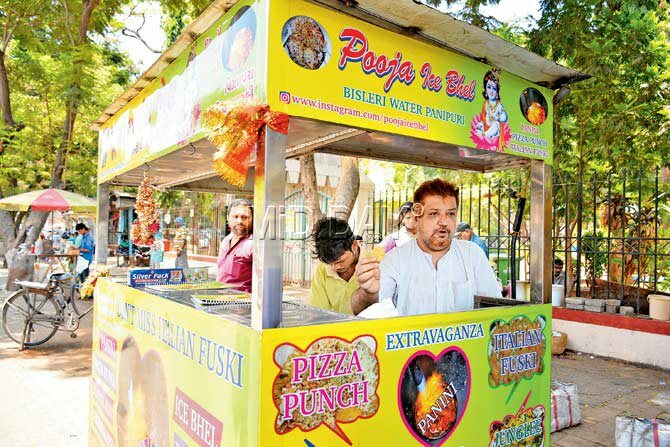 Our chatter is cut short by a certain Mehul Patel, who owns a neighbouring stall that also sells the fuski, and ownership of the concept seems a matter yet to be settled. Even as Sejpal claims to have introduced the fuski, Patel argues that it was his creation and that he has even patented it. Patel's stall, however, opens at sundown. But, if you happen to drop by after 6 pm, you can take your pick between the two. And, we'd like to hear from you, who you think did better. never thought of a puri pizza.. however I've been making naan pizza at home since ages.